For at least a decade, it’s been a family tradition to take in the Independence Day festivities hosted by Sandy City. The full carnival atmosphere—with inflatable rides, snow cones and other vendor booths—was more appealing to the kids when they were younger, but even into tween years, the late-afternoon parade provided entertainment, with floats that have often been surprisingly intricate and charming and the distribution of taffy. Entertainment generally includes live music performances from the dinner hour through dusk, plus “encore” playing after the fireworks. But most of the folks are there for the fireworks show, which fills the sky, accompanied by a fairly consistent musical set list: Neil Diamond’s “America,” “God Bless the U.S.A.” and plenty of Sousa. It’s nearly the same situation every Fourth of July: Summer has staunchly settled in down in the valley, regularly sending the mercury well over the 100-degree mark. This in and of itself wouldn’t be so bad if it also didn’t mean temperatures routinely hover around 75 degrees long after the sun has set and the midnight hour has come and gone. So, my remedy for the patriotic furnace has always been to head up into the hills and cool off in the mountains. 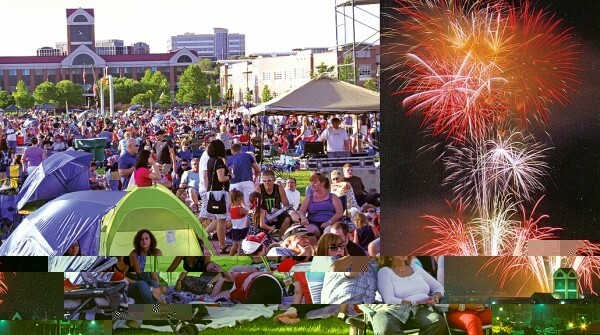 Not only does Park City sponsor a free public fireworks display that will rival any to be found down in lower elevations, but its annual Independence Day celebrations also provide a perfect opportunity to get out of the traffic-laden urban chaos. Most mornings, I wake up thinking about milkshakes, rock climbing or both. Unfortunately, it’s rare that any of this manifests—except July 4. For me, Independence Day is all about getting out into America’s natural areas that we’re lucky enough to have protected and climb some friggin’ rocks. Free from a desk and computer, I head to the Uintas with some of my closest friends. The sport climbing at Ruth Lake (Mirror Lake Highway, mile marker 35, $6 day-use fee), with its steep horizontally cracked quartzite, is superb. Peace Treaty was my first lead, so it’s near and dear, and other classics include Black Elk and The Legend. At this elevation, it’s nice and cool, but not as cool as the milkshakes at Uinta Drive In (235 E. Center St., Kamas, 435-783-4312) on the way home. I hold an Equal Opportunity Milkshake policy, because they’re all good, and I’d ideally eat several before driving the last short leg home. Going to watch the fireworks at Sugar House Park is exciting, but it can be a bit too much: the crowds, the parking, the waiting and the sheer intensity of the most overhyped and kitschy mode of celebrating our nation’s birthday. Several blocks away, the Sugar House Arts Festival (Highland Drive, between 2100 South and Wilmington Ave., 10 a.m.-7 p.m.) offers a more casual and relaxed way to spend the earlier part of the day. Many of the galleries and studios that are open for the Sugar House Art Walks participate. Local bands perform all day, and there’s a children’s area and a pet parade that kids love. It’s a lot of fun walking around the booths, checking out the works of local artists and craftspeople. My favorite part: lots of food choices, including some of the best food trucks in the area.